Tesla's "D" unveiling had a little early reveal thanks to USA Today but now we've had a chance to see it for ourselves. As rumored, Tesla is rolling out new all-wheel-drive-equipped versions of its Model S (check out our review of the original here). The top-of-the-line, dual-motor-equipped P85D has a measured 0-60 time of 3.2 seconds, which should put it among the fastest sedans ever when it starts shipping in December. According to Elon Musk, the system is a "huge improvement" that actually adds efficiency over a single motor -- about 10 miles in range per charge. That's apparently because there's no shaft between the front and rear axles, and the motors constantly adjust output so well that the car overcomes the weight of the second engine. Update: Musk revealed the truth about D's dual-motor setup, and then we rode along in the P85D. Check out the video and details after the break! Aside from the performance and handling upgrade of AWD (two other models with the tech will roll out early next year, dubbed 60D and 85D), Tesla is also introducing new driver-assist features to match and surpass what others like Mercedes and Lexus are doing, like lane keeping and self-adjusting cruise control. Its new cars can read speed limit signs and adjust accordingly, and even change lanes by themselves when the driver activates the turn signal, all powered by a system of 12 sensors that see around the car. 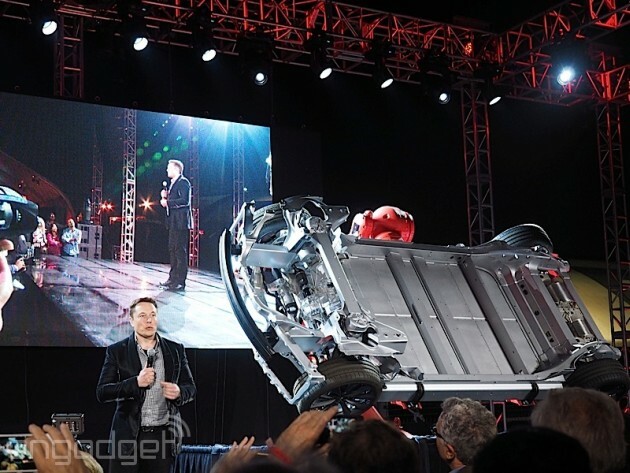 On stage at the launch event, Musk explained that the additions are a bit more than just assists (oh, and D -- in this case -- stands for dual motor). Musk also claimed that Tesla is attempting to "push the limit" on what's legally allowed for self-driving cars. These new models can park themselves, and even be summoned (while on private property). So, you can call it, and it will slowly drive to where you are, or park itself in the garage! As Musk promised yesterday, a lot of the required tech is already out there -- every car built in the last two weeks is already packing the sensors, and the autopilot features will be delivered in an OTA software update. This new technology is apparently all driven by ultrasonic sensors, and a new electromechanical braking system can bring things to a stop very quickly. Less glitzy, but still important, is that the cars will feature electrical power steering. Musk's not ready to call the autopilot features autonomous, just yet, but there's a definite sense that things are heading that way. On our short test drive in the new P85D (sadly, we weren't allowed to take the steering wheel ourselves), we came away impressed. In the first part of the demo, the driver slammed her foot on the pedal, exploding the car onto the runway through a rainbow tunnel that had us feeling like we were on an amusement park ride. That dual motor brought us from 0 to 60 in just 3.2 seconds, just like Tesla promised. Then, she enabled autopilot mode, and the car knew to stay in lane simply by detecting the white lines on either side of the road. It also knew to stay within the speed limit by recognizing the posted 25 MPH sign. To change lanes, she simply flicked the turn signal on, and it gently moved to the left. Finally, it knew to slow down and stop because the car detected a stopped car in front of it. All this was done without her having to touch the steering wheel or have her feet on the pedals. 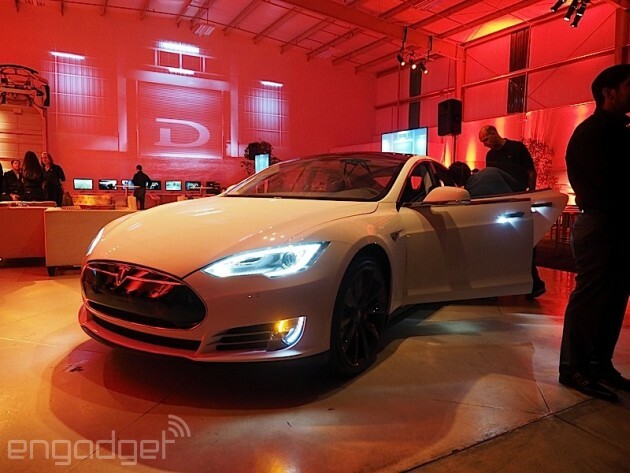 The interested among you can hit Tesla's website to price out a Model S equipped with dual motors and/or autopilot. While autopilot comes as a part of the optional "tech" package that's $4,250, adding a second motor to the P85D cranks up the price by $14,600 (tech package, 21-inch wheels and smart air suspension come along) although on the lower-end models it only adds an extra $4,000. How much power does that get you? For the P85D, 691HP (470 at the rear and 221 up front), while the 60D and 85D have 376HP, divided evenly front and back at 188HP each. It would be far easier to carry than a dedicated pen. The increased demand for metals could have social and environmental consequences.